Rose is such a great flower, and has quite a few medicinal properties. However, we also forget that it's a traditional ingredient in quite a few foods, especially of the Middle Eastern variety. Using rose petals, rose water, and rose hips is a great way to add a bit of flair to any dish though. Check out some of my favorite recipes using the flowers (or water) and hips of this great plant. Rose petals, and rose water, have a great floral taste that enhances quite a few dishes. It's more commonly used in sweet, dessert style food. But rose goes so well with so many spices that you can really add it into most any spice mixture. Rose is a great addition to Berbere, Garam Masala, and Adveih, and well as many more. Check out these 5 recipes using rose petals (or rose water made from those petals). 1. Starting with a treat! Rose petal jelly is delicious on any occasion, but adding a little clove and cardamom steps it up to a treat that will be hard to put down. In a small saucepan, bring the water to a boil. Stir in dried Rose petals, cloves, and cardamom pod. Remove from heat, cover and let stand for 15 minutes. Strain and discard the solids. Return to the saucepan and stir in the fresh petals, lemon juice, and pectin. Stir until the pectin is dissolved. Over high heat, bring the new mixture to a boil and add the sugar. Set a timer and boil for 2 full minutes, stirring constantly. After 2 minutes, transfer mixture to sterilized jars, seal, and allow to come to room temperature before placing it in the refrigerator overnight to set. After it has set, it will hold in the pantry for up to 6 months, or in the fridge for up to 1 year. 2. Roses in a savory dish? No way! Well, guess what. Roses go great with savory things too! This recipe features roses used in a Moroccan style sauce called a Chermoula, which is usually used as a marinade for fish. This recipe, however, uses the sauce for roasting a mixture of chickpeas, carrots, and zucchini. You can use any of the left over sauce for other dishes such as eggplant “steaks,” shrimp kabobs, chicken, or even tofu. It's so versatile. Preheat your oven to 350 degrees F. Combine all your sauce ingredients in a food processor and pulse until a thick paste forms. Adjust any seasoning if necessary. Toss the carrots in some olive oil and place them on a lined cookie sheet. Sprinkle them with a little salt and pepper, and bake them for 10 minutes, or until tender. Combine all remaining other ingredients and toss well, coating the vegetables well with the sauce. After the 10 minutes are up, remove the carrots from the oven and add to the vegetable mixture. Toss once more to coat the carrots and place the mixture back onto the cookie sheet. Roast for 25-30 more minutes, or until carrots are fork tender and slightly charred. Remove from the oven, drizzle a little more sauce on top (if you need to thin it out, add a bit of water) and a dollop of yogurt. 3. Back to more familiar rose territory. This sweet bread makes a great treat either drizzled with honey or used to make a killer french toast breakfast. 4. Rose makes a refreshing drink as well. Not only do the petals and hips make a lovely tea, but you can add them to lemonade, sangria, mojitos, etc. Here's one of my favorites, Hibiscus Rose Lemonade recipe for the summers. In a saucepan over medium-high heat, bring the sugar/honey and water to a boil. Reduce heat to low and stir until sugar/honey is dissolved. Add in the rose petals and hibiscus flowers, cover, and remove from heat. Allow to cool for 45 minutes. Pour mixture over ice and stir well before adding in the lemon juice and stirring one last time. Taste your lemonade and adjust the sweetness if desired. If you want some more rose flavor, simply add a ½ tsp of rose water at a time until it reaches the flavor you want. 5. I love chia pudding. It makes for a great breakfast, starting you day off with all the benefits of chia. It's also a great snack for when I'm just craving sweets. This variation adds in the soft, floral flavor of rose and the rich flavor of chocolate. Combine all ingredients in a bowl and mix well. Optionally, you can put them in a food processor and process to make a smooth chia pudding. Cover and refrigerate over night (or at least 4 hours). Mixing it a few times within the first hour helps it to gel evenly. This one is great topped with strawberries. Rose hips (the fruit of the rose plant) are super high in vitamin C, making them taste a bit on the citrus-y side, though some people compare their taste to a tart cherry. You can use them in place of cranberries, citrus, or cherries in just about any recipe. However, when they're dried they are usually pretty hard. So if the recipe calls for dried fruit, make sure you add a bit of water or juice to them and allow them to reconstitute for a bit before using them in your recipes. 1. This dip is a great slightly sweet, tart dip for just about any occasion. I like to serve this with gluten free graham crackers, but it also works well with apples and other fruit. In a small bowl, combine the rose hips and pineapple juice. Chill overnight to reconstitute. Once reconstituted, combine all ingredients (including the reconstituted rose hips, don't drain them) in a medium sized mixing bowl and mix well. Chill for 10 minutes prior to serving. 2. This twist on everyone's favorite party snack is full of surprises. It's not only a great dip, but I also like to use it on some of my savory main dishes. It's great over turkey (or any poultry really), pork, and it also adds a southwestern flare to eggplant “steaks” and veggie burgers. Combine rose hips, lime juice, water, and honey/agave. Mix well, cover and chill overnight to reconstitute. When reconstituted, add in remaining ingredients in a food processor and process until they reach your desired consistency. 3. Rose hips in rice? Heck Yeah! Rose hips add a great bit of sweet and tart flavor to a number of dishes, but I'm really a huge fan of how they can make rice and quinoa dishes really pop. This recipe makes for a great side dish, use quinoa instead of brown rice, and add some more of your favorite vegetables (such as Brussels sprouts or green beans) to make it a super healthy and filling one dish meal. In a sauce pan, over medium-high heat, saute the olive oil, onions, and celery together until just translucent. Add in the rice, water, vegetable broth, and rose hips. Bring it to a boil. Reduce heat to a simmer, cover and cook for about 40 minutes, or until most of the liquid is absorbed and the rice is tender. Stir in remaining ingredients, cover again, and allow to cook another 5 minutes, or until all the remaining liquid is absorbed. 4. Bread is such a staple in most of the cultures of the world, and there are so many different kinds of bread to make. Quick breads are my personal favorite for a number of reasons, although the most important one is that they're the easiest to make gluten free. This quick bread recipe also makes for great muffins for breakfast, or just a snack. Combine 1 tbsp ground flax seed with 2 ½ tbsp water, mix well. In a separate bowl, combine rose hips and apple juice. Set both mixtures in the fridge to chill overnight. Preheat the oven to 350 degrees F. Grease a 9X5in loaf pan (or line a muffin pan with papers). In a medium mixing bowl, add in flour, ground chia/flax seed, baking powder, baking soda, and salt. Whisk well to combine. Fold in rose hips and lemon zest. Mix well. In a separate bowl, mix honey (or agave), chilled flax seed mixture, orange juice, and lemon juice. Stir well. Pour mixture over flour mixture and stir well until combined. Pour batter into your prepared pan and bake about 1 hour (muffins may not take as long, so check them after about 30 min and every 10 min after that). Cool in the pan for about 10 minutes. Invert the pan to flip out the bread and continue to cool on a cooling rack. 5. Here we come to the easiest recipe in this post. And one of my personal favorites. Simply combine all the ingredients in a bowl, cover and allow to sit overnight. Pour mixture into a food processor and process until it reaches your desired consistency. Store in the fridge. If you want to skip letting it sit overnight, you can pour the mixture into a saucepan and bring it to a boil on the stove top. Reduce it to a simmer and allow to cook for about 4-5 minutes. Allow it to cool and puree it in the food processor. 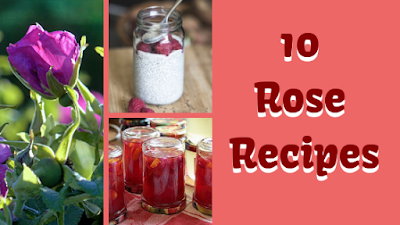 I hope you enjoy making (and eating) these great Rose recipes! If you have any questions or comments, please leave them below!